As with anything, working out requires a balance between work and rest. 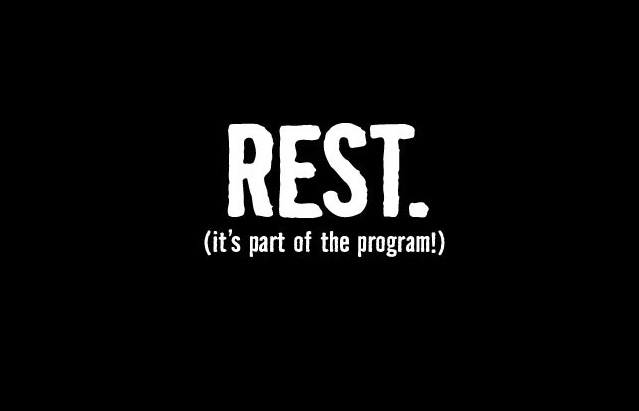 Most people in the workout community know that some rest is needed, but many do not know how much or why. Unfortunately the answer to that is not quite as easy as a set number of rest days between workouts. A lot of it depends on the person and the type of workout being performed. Lets look into how those factors play a role in our workout plan. Based on my research, most studies show that 48 hours is the suggested time needed to fully recover from a hard workout. That being said, it does not mean you have to take 2 days off every time you hit the gym. If you are training a specific body part or group and break up the body working different muscle groups each day, you might already be allowing at least 48 hours before reworking that same part. With some planning, you may not need to skip the gym to allow your muscles time to recover. Make sure you take into consideration that some of our movements work more than one muscle group, and you may have to skip a day here and there if you are overlapping. If doing High Intensity Interval Training, incorporating the entire body like in most of our WODs, you may need to take a full day off and allow yourself time to get the break you need. That being said, if you have a limited number of days you can hit the gym and are unable to rest in between your workouts, resting for a couple days after is also effective. Recent studies have shown that working out hard for a few days in a row then recovering for a few days after can be just as effective as taking the two days off between working muscle groups. Another factor you must take into consideration is age. As much as we don’t want to admit it, our bodies do not bounce back like they did when we were younger. As we age we may experience slower muscle recovery and growth. Not all workouts are created equal. We have all left the gym completely whooped and felt the sore muscles the next day as proof of our efforts. When you have one of those absolutely draining days, you may want to take it easy before going hard again. Sore muscles is not a reason to take a rest day though, it is just a sign that your body reacted to what you did. One of the best cures for sore muscles is to stay active and get back in the box. The important thing is to allow your body some time to recover. There is no perfect number or prescribed plan that works best for us all. Schedules, personal preference, and your individual training plan play a key role in the way we workout and how our bodies manage the stresses of those workouts. But why is rest needed at all? When we workout hard we actually create micro-tears in our muscle fibers. Our body needs time to repair these tears and in doing so muscle actually forms and grows. This is how we become stronger. If you don’t allow these fibers time to heal and build, you will actually start to see a plateau in your performance or even a decrease in strength and ability. These tiny tears signal a response from the body to regenerate muscle cells and increase muscle size. Rest days are not only for muscle recuperation. Lack of rest can lead to overtraining, which in addition to decreased performance can lead to elevated blood pressure, decreased immunity, sleep deprivation and more. It is also for mental health and to prevent ourselves from being burned out by an overly intense training regime. While the gym is good for our mental health, an occasional break is needed to balance and enjoy your new found strength and confidence. Taking a step back and breaking up the monotony of the schedule is a good way to give yourself a better focus and perspective on goals and your path. So how do you know if you are getting enough rest between your workouts? If you are seeing a plateau in your performance despite making it into the gym consistently, aches and pains that are not going away or if you just can’t kick that cold or runny nose that you have been nursing, you probably need to up the rest. By not resting and allowing your body to heal, you can cause injury by compensating. When we hurt, we try to avoid movements that cause pain. If you are not resting and have an underlying issue, you may start altering how you workout to avoid the painful motions and potentially create another issue. I am currently recovering from hernia surgery and as much as I want to get back to working out, I know my body requires time to heal or I could cause a much bigger issue than I already had. Also, as mentioned before, overtraining can compromise your immune system which may lead to you getting sick or staying sick, which will also effect your gym performance. Remember last week’s, Less is More blog, sometimes giving your body the extra day off may just be what it needs to make improvements and step up your game when you get back to it. While a rest day may seem like you are not making progress you are actually allowing your body to play catch up and grow. Don’t think of your rest days as rest but recovery days. Your mind and body require the break and it will actually benefit your performance and results. Something that is commonly misunderstood about rest days is they are not meant for sitting around and vegging out on the couch. Active rest is the most effective form of recovery and will allow us to prevent those sore muscles, keep that metabolism revved up and our mental status clear. Try doing something that gets your blood flowing without too much stress or strain on your body and also allows a mental outlet. Common suggestions are walking/hiking (maybe join a TorchRuck Club event), paddle-boarding, an easy bike ride, or yoga. Allowing yourself to move and use your muscles in a way that is not the same movements they are used to may be just what you need. As a lifelong horseback rider, I can honestly say that no matter how many times I hit the gym, there are muscles that riding works that you can just not find any other way. It is humbling and eye opening that when I think I’m in shape, 40 minutes on a horse will make me feel so sore and weak, that’s it like I haven’t worked out in forever. Another important part of our rest and recovery period is nutrition and sleep. Our muscles need nutrients and extra protein to not only heal but to grow. Properly fueling the body is as important on our days out of the gym as the days we are in it. Sugar and empty calories will not provide our body with the energy and nutrients needed to repair and grow our muscles. Sleep is a huge part of our rest and recovery and does not just happen on our days off. Getting a good night of sleep not only gives you more energy, but allows your body to maintain it’s hormonal and chemical balance in a manner that sets you up for success. Rest days are not just days off from the gym; you should plan them just like you do your workouts. That means making an effort to incorporate them into your workout regime and focus on what they are for. It is not enough to say that you missed a couple workouts so your rest day is taken care of. Make an effort to get the gym consistently, plan the days you need rest, and make sure that you are fueling your body in a way that allows it to recover and build muscle. Do that and you just might find that perfect balance to keep you motivated, getting stronger and feeling better.